Lucien had known for some time that all was not well in his home. He could feel it in the air, a subtle taint that had crept in and lay hidden deep within the ancient mansion. The main corridors were safe – his boots rang in clear tones on the cold marble floors, and the ice sculptures that hung down in crystalline cascades still sang in harmony with the voices of his people. But the echoes came back distorted, a warning as certain as an alarm bell that something, somewhere had gone terribly wrong. He had searched everywhere, in every room from the highest attic to the lowest cellar. Every place but one. His wife’s suite was up several flights of stairs, and overlooked the great hall. Lucien hesitated outside the door, his heart leaden within his chest. There was no doubt now that Serenna was behind the attacks. It was only a matter of finding out why. The wards on the door were unlocked, and a frown creased his brow as he entered. Serenna was never that careless. The room looked undisturbed, filled with all the pretty feminine things his wife kept about her; soft blankets on a rocking chair and a sewing kit beside it, flowers and perfume bottles on the dresser. The next room held her library, and a small table where she prepared her healing crystals. Beyond that, the door to her work room was unlocked, and he could see a dim light spilling out through a gap where it had not quite been shut. Lucien hesitated again, his instincts warning him to use caution. A smell of dried herbs and incense wafted out, along with a musty hint of rot that undercut their more delicate scent. A moment’s thought let him place the smell – moldy leaves, like those on a forest floor. The forest kin were seldom seen, and almost never left their homes. To have one set up shop here, in the midst of all this cold stone was unheard of. And yet, twice now there had been plant based attacks in his home. He studied the doorway, but there were no obvious signs of malign enchantments. If someone was inside and had already prepared a trap, he saw no point in making a stealthy entrance. Chill energy wrapped around him as he blew the door open. No cries came from inside, and he strode into a room coated with frost. Smoking candles were scattered about the floor, knocked from their candelabras by the icy wind. A summoning ring was set into the floor, and in its center lay a small, twisted branch covered with casting marks. Lucien knelt beside the ring, careful not to cross it. Foul energies spilled out from the circle, uncontained in any way. He leaned over to look underneath the branch. Roots shot down into the flagstones. They had caused hairline fractures to spread out to the edges, breaking the protective ring. He stood up quickly, and turned to the small lectern behind him. Serenna’s day journal was laid out, open and unlocked, just as the door to the workroom had been. Lucien glanced back at the branch. His enemy was taunting him with the answers he sought. He weighed the danger against the need to know what his wife had summoned, but in the end, there was no other option. The first entry had been made twenty one years ago, just before his wife had become pregnant with Nox. Lucien paused with his hand hovering over the next page. The jaws of the trap were closing. This was how the enemy would break him, then. Not with swords or spells, but with the words of his own beloved wife. They knew him too well. He had to read on. He had to know how he had lost her. The words seemed to reach out from the pages, and hold his heart in an iron grip. Lucien paused there, his shoulders bowed beneath the weight of his grief. He had almost lost them both, and in desperation he had done the unthinkable. Lord Galen had banned the technique of healing with an aura graft for good reason. Lucien had been a fool to think he could make it work. He had given Serenna a piece of himself, never thinking how traumatic it would be for her to lose a piece of her humanity in exchange. All he had cared about was keeping her and the baby alive. He forced himself to read on. If she had lived with this for twenty one years, he could at least bear witness to the price she paid for his folly. The rest of the journal was a slow, steady descent into madness as the spirit laid its hooks into her. Details of everything Serenna had done to their daughter was there, laid out in harsh, clinical terms. It was a miracle that Nox had survived at all. Lucien sank down into a chair that sat next to the lecturn. He let the journal dangle from his fingers, and covered his face with the other hand. Energy flowed in from every corner of the mansion as Lucien gathered up his will for lethal strike. “She can work with an accomplice,” Nox spat back. The crunch of footsteps on ice caused them both to turn around, only to see the focus of their argument standing in the doorway. “What have you done to my solarium!” Serenna said. “I’m fine mother, thanks for asking,” Nox replied, bitterly. A cold, sick feeling settled into the pit of Nox’s stomach as she watched her mother do the impossible; if Serenna could control the elements, then she was no longer completely human. The truly terrifying part was imagining who could be strong enough to alter her, without her husband noticing. “I will make her so,” Serenna said. “Begone!” Serenna cried, but the creature only laughed as it faded away. The setting sun stretched long shadows across the floor of the solarium, and painted the walls with splashes of red and gold. The servants had long since cleared away the remains of dinner and left Nox to wait for her father, with only Grimm for company. A half-smile twisted the corner of Nox’s mouth. “Look on the bright side, I’ve already found a way to circumvent her ugly little lesson. That should piss her off to no end.” She carefully sat down a small glass bottle next to the book, just as a jolt of energy sizzled between the book and her hand, standing her hair on end. “Ow-Ow-OW-Dangit!” she said, shaking her stinging fingers. “Well, at least it zaps me at regular intervals. I can work in between them.” She took the stopper from the bottle, and drew a tiny amount of liquid into the attached eyedropper. Nox squeezed the stopper. A single of drop of acid hit the book, and lay there shimmering in the sunlight. A wisp of smoke curled up as it started to eat into the binding. Then it exploded in a blast of green light, throwing her across the room. Grimm just barely got behind her in time, and grunted as she thumped into his side. Nox wheezed as the air got knocked out of her. “Are you all right?” Grimm rumbled. “She can hire someone,” Grimm said, and sneezed again. “Ooh, careful!” Nox said, as the glasses went flying. The instant the glasses touched the book, the casting marks on the cover flared into life. Writhing tendrils of energy burst outwards toward them, and Grimm howled, surrounding Nox in a sonic shield. A flash of electric blue light filled the room as she added her own aura shield to bolster it. The vines slashed at their defenses with a mindless ferocity, and a sticky, corrosive sap started to ooze over their combined shield, burning holes in it. Nox reached out in desperation for the one source that could generate enough pure elemental Ice to freeze the vines. Down in the main hall, she could sense the brass hoops of the great Weather scope start to move, sluggish and heavy. “Please, let it work this time!” She threw her will against it, trying to find the strength to move the ancient artifact and summon the winter winds. The weather scope turned once, twice… and stopped. And the winds came. The doors to the room blew off their hinges from the force of the gale that hit them. It howled into the room, and buried everything in a thick layer of ice, stopping the vines in their tracks. Nox huddled beneath Grimm, and she could feel him shuddering from the cold and his wounds. For a brief moment, Nox thought she had actually managed to use the artifact. Then her father broke through the ice that encased them. “I knew it was too good to be true,” she sighed. 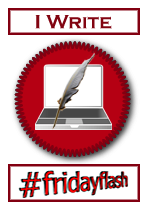 Posted by techtigger in flash fiction, interview, writing.